Carrying your baby around without causing any harm is considered to be a very serious job. You need to be very careful about the safety as well as the health of your baby. Thus, baby carriers for infant and newborn are introduced to ensuring your baby’s happiness. These are ergonomically designed so that your baby remains always comfortable. They are extremely easy to use and come with a completely breathable mesh. As a result, you will not have to worry about causing discomfort to your baby. Even the straps, height as well as the size can be adjusted for getting the optimum results. A toxic product can lead to many adverse effects. So, what points shall one consider for making the final selection? 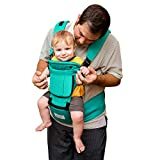 Well, our review on baby carrier puts forward the exact points that constitute to the excellence of the product. The LILLEbaby complete takes the comfort of you and your baby very seriously. To start with, it has a great ergonomic design with a very flat learning curve. The head and neck support is extremely easy to use and can be unbuckled and brought down quickly. When you are ready to bring it back up it does the same effortlessly and without the noisy Velcro or hard to use buttons. Moreover, it has a cushy 3D breathable mesh that does not create a claustrophobic atmosphere. You also get a zipper pocket at the front to keep essentials like cellphone, wallet and keys. If it’s sunny outside and you want your baby to be shaded and cool, then this carrier has you sorted. It comes with a detachable hood that can be set up and brought down very easily to suit your needs. You can carry your baby in six positions. Shoulder straps are padded to make your long busy day comfortable. The baby carrier seat is pretty wide. Be it at home or outdoors, your baby will need a lot of attention and contact. Baby Bjorn’s Carrier eases that task by several folds. If your baby falls asleep, you just need to unbuckle the carrier and lay your asleep baby in a comfy position. The manufacturing process of this ergonomic baby carrier is controlled very strictly to keep the product safe for your baby. Being made of cotton, it doesn’t have any harmful materials and is compliant with Oeko-Tex Standard 100, Class 1. Further, it even comes with an all-weather baby cover that will shield your baby from windy, wet and cold outdoor conditions. A foldable design which means you can carry it with you at all times. Best for your newborn baby. You can carry your bay in 2 different positions. Using this m-position baby carrier is really simple and requires just 3 simple steps. It has Velcro tabs on the inside of your waist belt and you can use them to adjust the seat height for your baby. The tabs have coloured borders to inform you which one to use according to your baby’s age. Can be worn in a backpack style or in a crossed manner, it comes with a UPF 50+ tuck away hood ensures protection against the sun as well as wind. Furthermore, it comes with a neck cushion that can be adjusted to suit your growing baby. You can even adjust the seat to face your baby in or out. Whether you have a larger or petite build, the Ergobaby Omni 360 fits everyone and cherishes parenthood. Head support can be adjusted with buttons that don’t make noise. Best for newborns and toddlers who are over 7 pounds. Waist belt even has padding for lumbar support so that you don’t suffer from back pain. Millions of babies and their parents have enjoyed the reliability and comfort that Babybjorn offers and you can be next. This product is one of the most versatile designs that the brand has come up with and is a paediatrician favourite. 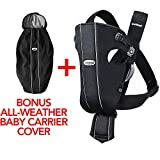 You can use the carrier for year’s right from day one without any infant inserts. Your shoulders wouldn’t feel too much strain since it has adequate padding and with the waistband, the weight distribution is further improved. With four carrying positions including at the back you can easily take care of your business while paying full attention to your baby. 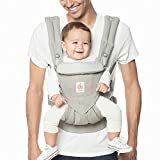 Plus, this lightweight baby carrier even gets a quick and easy zipper system that adjusts the seat as well as the hip height of your baby the most natural and comfortable position. Other similar carriers from competitors use complicated buttons and straps to achieve the same. Having the zipper system, you save time and it is much simpler to use. Fit for newborn and growing babies till 3 years of age. Compact and best for young parents on the go. Fabric loops so that you don’t have extra waist belt dangling around you. 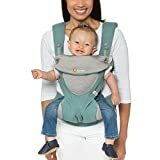 You won’t have to worry about a long day with your baby on your back due to the excellent weight distribution of this carrier. The shoulder straps are designed to be much wider and thicker with a sponge interlayer. This helps in lessening your burden and distributes the weight pretty well. Due to the soft spongy layer, your muscles don’t go through a lot of strain. Security and safety for mother and baby is Lictin’s top priority. So they have implemented both fastening belts and buckles to increase both you and your baby’s safety by two folds. Furthermore, it even has a removable hood to shield your baby from harmful UV rays and chilly breeze making it fit for use in multiple seasons. Lastly, there is a pocket window for increasing the breathability whenever it’s cool or warm. Meshed breathable layer reduces sweat. The safety belt features an H-type design. Cheekbones don’t have to bear the brunt due to cushioning on waist pads. One of the premium models in the market with superior quality materials and long-lasting construction. First of all, it has 6 positions to seat your baby in a relaxed yet very secure way. 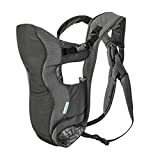 Mothers can even breastfeed their newborns conveniently while using this carrier. Apart from having zipper system as well as 3D mesh for enhancing breathability, the crossed straps for shoulders are generously padded. Also, the patent seating position is easily adjustable whenever required. Being a product promising universal fit, it has an M-shape position along with qualifying as a ‘hip-healthy’ carrier. The sturdy waist belt helps to maintain a healthy posture. Can be used in all seasons. Since 1920 Evenflo has been making the lives of thousands of moms easier and babies happy throughout the world. Their carrier is probably the cheapest with the reliability from Evenflo. With two carrying positions, your baby has all the freedom it needs while you can safely do all the necessary chores. By not implementing extravagant construction, it can save costs to bring you an affordable product. But you don’t have to compromise since you get features where it really counts. Even the contact at your shoulders and baby’s leg holes and head get that extra padding. Offering 2 positions for carrying and panels constructed of breathable mesh, it will help to stay cool with the increase in airflow. The exterior fabric is vented. 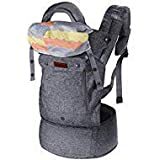 Loads of functions and features make this convertible baby carrier one of a kind at an attractive price point. It has 6 chained pockets that are easy to reach and very useful for storing various things. Your phone, power bank, earphones and even your baby’s diaper will fit into these pockets. They also have intelligent design since the pockets expand away from your baby’s body towards the outside. Unlike other carriers, your baby doesn’t have to feel the bulk and stays comfortable. The convertible seats are also adjustable to change the seat height. With the convenience of zippers, you can adjust the hip and seat height. You can achieve the ideal M position that keeps your baby’s bottom below the knees and the spine in a naturally curved position. The internal panel that hugs your body has a meshes design which maintains a good airflow among you and your child. Fit for babies over 3.6 kgs and under 18.14 kgs. Be it, dads or moms, this is suitable for all with waist belt can be adjusted between 29 – 55 inches. This carrier from BabySteps is one of the most affordable units you can find in the market. Even though it is feature rich and has a modern ergonomic design, it won’t burn a hole through your wallet. It is made of a breathable material that doesn’t create a sweaty experience unlike some other products in the market. Use it in any season, be it summer, spring or winter and you wouldn’t find its usefulness diminishing by any means. The waist belt has velcro for an extremely strong and snug fit but won’t irritate you by sticking to your garments. Constructed of a combination of organic cotton as well as polyester fabric, the windproof hood is detachable. Finally, the 360-degree quick-tie buckle proves the baby carrier for nursing is flexible. 6 carrying positions for your baby. Shoulder straps aren’t prone to slipping due to their H shape. 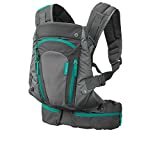 The name and the colour option for this carrier go very well with the carrier since they complement one of its integral features. It has mesh all over the back side of the carrier and a panel at the front. 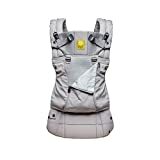 This keeps a healthy flow of air keeping both you and your baby very happy and comfy. The shoulder straps of other carriers are just padded generously. But Ergobaby doesn’t cut corners and other than ample padding has even integrated a mesh to keep you sweat-free. Putting it on to your body is also very easy and effortless. With a large buckle and two positions for adjusting the waist belt, you can have a nice and snug-fit for optimum safety. Even it has a large privacy hood that comes in handy in several situations. You can nurse, feed your baby with the hood on just protect them on days where the Sun decides to glare a bit more. Your lower back will thank you for the lumbar support. Best for growing babies between 4 months and 3 years. All carry positions have an equal comfort level and ease of manoeuvring. Ensure not only your baby’s comfort but also yours by including the most reliable as well as a comfortable carrier for your baby.